Another huge kick in the teeth to fossil fuels! Ten square meters of ocean bottom produce as much energy as a football field covered with solar panels! Expect fossil fuelers to claim waves are "too intermittent" to provide "reliable" energy. They will also willfully ignore the FACT that storm conditions which cause home owners to use more energy will correlate EXACTLY with increased wave energy. The propagandists ALWAYS REMEMBER WHAT TO LEAVE OUT! Underwater Compressed Air Energy Storage: Fantasy or Reality? Underwater Compressed Air Energy Storage (UW-CAES) — a step beyond underground energy storage in caverns — may soon offer conventional utilities a means of long-duration load shifting for their large-scale electrical grids, and niche microgrid operators a means of reducing their fossil-fuel dependence, say its advocates. More than 40 percent of the world's population lives within 150 kilometers of a coastline. Thus, the hope is that UW-CAES can benefit both from existing and future wind and solar microgrids as well as from coastal cities using conventional electrical grids. 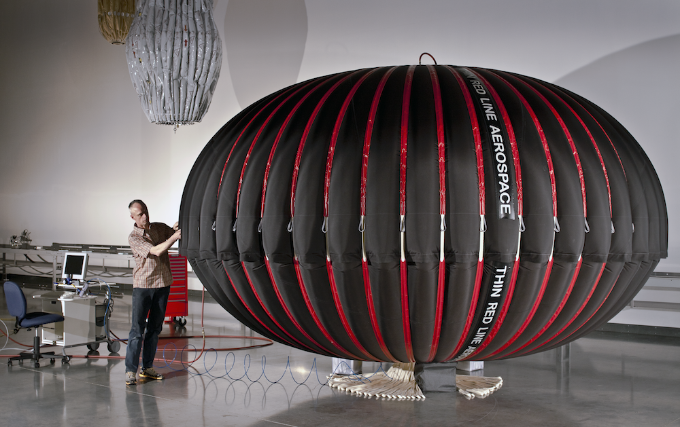 The basic concept involves some form of “energy bag,” a balloon-like vessel made of stretched fabric, which is anchored to a sea- or lakebed. When energy is needed its compressed air can be released to drive turbines. Maxim de Jong, CEO of Thin Red Line Aerospace near Vancouver, Canada, says with such compressed air storage, it’s best to use high-efficiency Rolls Royce-like turbines. Curtis VanWalleghem, CEO of Toronto-based Hydrostor, said their venture focuses on electricity-to-electricity storage, specifically in daily load-shifting of longer than three to four hours. Hydrostor says its strategy will initially be to “partner with utilities and energy producers to accelerate large-scale deployment.” In Toronto, he said the benefit for Toronto Hydropower comes in deferring transmission- and distribution-line investment. “There are four or five days a year when Toronto Hydropower doesn’t have enough transmission capacity to bring power to the city,” said VanWalleghem. “So, you either have to build a couple of hundred kilometers of transmission lines to the nearest gas plant, or you’ve got to find a peaking capacity to put in a city.” This time period is when electrical demand is 20 percent higher than average. In order to solve this problen, VanWalleghem said the Lake Ontario UW-CAES project is “permitted” up to 2 MW, however, its initial installation at a depth of 80 meters some 5 kilometers from the Toronto shore will handle about 750 kW from Toronto Hydropower. Electricity stored underwater in this instance is generated from the normal electric grid. Using their electricity, Toronto Hydropower will use a compressor to store air in an underwater holding tank after being fed through pipelines from the city. To turn the compressed air back into electricity, Hydrostor will use a turbo-expander linked back into the grid. The technology’s advantages include off-the-shelf compressors, turbines, heat exchangers as well as “free” air and ocean pressure. UW-CAES advocates even note that the tech is environmentally friendly and the bags can act as “artificial reefs” for marine life. If a project is more than 3 kilometers offshore, however, then the cost of piping and the energy loss running compressed air through pipe becomes a real financial concern, according to de Jong. Hydrostor has also signed a power purchase agreement with WEB Aruba N.V. for a UW-CAES facility based on the Canadian venture’s proprietary technology. The project is to be installed near Aruba’s Vader Piet Wind Park on the island’s southeastern coast later this year. That’s very different from batteries, which normally kick in whenever a cloud comes over a solar field or gusts drop off over a wind farm, said VanWalleghem. While microgrid developers have traditionally focused on using battery energy storage, Peter Asmus, a principal research analyst with Navigant Research, said UW-CAES could play a role. And he notes that Hydrostor is uniquely positioned for larger islands that mimic a larger grid’s need for bulk storage. Yet the ideal niche market is arguably in replacing fossil fuel microgrid generators. De Jong said these are normally found on wealthier small island communities that can afford renewable energy, such as the Maldives, Reunion and a few affluent islands in the Caribbean and Pacific. VanWalleghem said that aside from Aruba, Hydrostor is also talking to other islands about solar and storage for energy plants in the 2- to 5-MW range. Before these UW-CAES projects can be brought to fruition, however, there are several economic challenges to iron out. In offshore configurations, the ideal target installation depth would be 500 meters. Thus, when submerged, de Jong says the ballast required to retain a commercial energy bag would require the equivalent of 130,000 cubic meters of concrete (or some 3.6 times the volume of the energy bag itself). As de Jong points out, regardless of depth, 1 cubic meter of air in an underwater bag will have a buoyant force of 1 metric ton. However, he says due to the potential for an accidental release of such bags from the ocean floor, a minimum 10-metric ton restraining structure would also be needed. Agelbert NOTE: I guess this is the Fossil Fueler cue to say... "Renewable energy is not ready for prime time!". Keep repeating moronic mantra, fossil fuelers. We know what you are about.